So often, we know a cuisine only by a few staple items: Bibimbap is to Korea as Tacos are to Mexico. You get the idea. To rectify this issue, one must befriend immigrants or travel to the country of origin to understand the real flavours and breadth of a cuisine. The people of Perth, however, have been given a gift from the Roman gods of feasting in the form of No Mafia. Specialising in Southern Italian fare, you will not find pasta or pizza here. This is inspired Italian food that highlights quality, fresh ingredients with Italian specialties like pecorino, nocello, and white anchovies. No Mafia combines the best parts of nostalgia Italia with 2020 Roma. An artistic Italian film projects on the back wall while a funky blend of remixed Sinatra, Nick Cave and Alt J thumps overhead. Meanwhile, the ubiquitous straw-encased bottles of Chianti have been replaced with an inspired cocktail menu that boasts six different vermouths and multiple aperitifs. The wine and beer list is great, and includes both local and Italian options. The narrow gallery-type seating is best suited for smaller parties (about 6), and I'd recommend sitting towards the door to get a glimpse of the activities in the open kitchen. Our Italian waitress expertly guided us through the menu, steering us towards the dishes best exemplifying Southern Italian cuisine. She was also amazingly knowledgeable about the digestifs – introducing us to Braulio as an alternative to Fernet Branca, or Cynar – and even had the kitchen create us a mini-dessert when we had overfilled ourselves on other goodies. As for the food. Mama Mia. 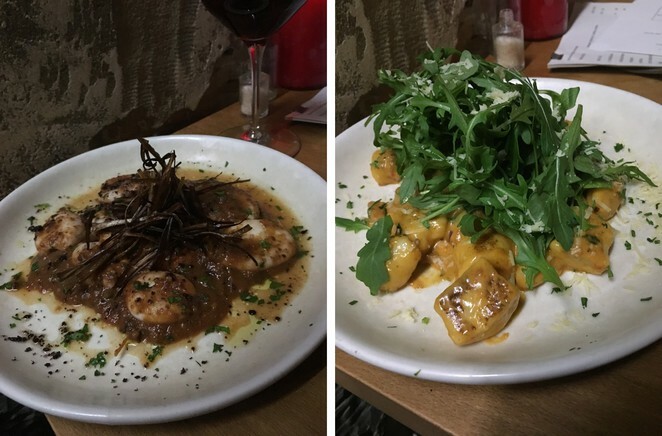 The menu presents a good range of options – from antipasti, to salads to roasts. They even managed to improve upon the Caprese –a classic I usually avoid due to the tendency of chefs to use sub-par ingredients doused in balsamic. Except here, the tomatoes and mozzarella are fresh and the reinvention is exciting (hint: it involves olives). For our mains, we noshed on gnocchi and Napoli-style squid. Taking a lesson from the Italians, we used our slices of Bread in Common sourdough to slop up every last bit of the sauce. We missed out on the homemade limoncello, opting instead for a real, Italian-style macchiato that was perfectly proportioned and frothed. In addition to the limoncello, we also regret missing that there weren't 4 of us to be eligible to partake in the chef's choice menu. At only $40 each to sample of the best dishes of the day, this is an incredible steal. As is their $30 fixed-price, 3-course Tre Amici that runs Mon-Thurs. In fact, given the reputation of Perth as a high priced city, this was hands down the most enjoyable and best value meal of our excursion. It is also open late and well-located in Northbridge. While I still think you must travel to the mother-land to experience a cuisine in its native environment, No Mafia provides an excellent education in the meanwhile.